Summary. Progressive multifocal leukoencephalopathy (PML) is a neurological disease caused by infection of the central nervous system (CNS) with the JC polyomavirus (JCV). JCV is endemic and infects a large proportion (70–90%) of healthy individuals worldwide, but infection is latent. JCV reactivation may occur, if the immune function is compromised. Aim: To present a PML case in a CLL patient after a long course of disease and treatment with fludarabine. JCV virus infection in this patient was proven both in brain biopsy material and blood. Methods: Patient with a nine-year history of CLL was hospitalized with the weakness in the right leg and left hand, tremors, speech difficulties. An MRI diagnosed infiltrative glial tumor of the left hemisphere, proliferating predominantly in the frontal lobe, more in the gyrus frontalis superior region. CNS tumor biopsy performed. Results: Morphology and immunoprofile of the lesion consistent with progressive multifocal leukoencephalopathy. The material from biopsy was diagnosed as positive for JCV DNA. JCV and HHV-7 genomic sequences were found in patient’s PBL DNA sample. In a plasma DNA sample, only genomic sequences were detected. Conclusion: The present case draws attention to the fact that the use of fludarabine and its combinations in CLL therapy increases the risk of JCV infection reactivation and development of serious complications like PML. Abbreviations used: CLL — chronic lymphocytic leukemia; CNS — central nervous system; JCV — JC polyomavirus; LPD — lymphoproliferative disorders; PBL — peripheral blood leukocytes; PML — progressive multifocal leukoencephalopathy. Progressive multifocal leukoencephalopathy (PML) is a neurological disease caused by infection of the central nervous system (CNS) with the JC polyomavirus (JCV). JCV was discovered in 1971 and is a type of human polyomavirus genetically similar to the BK virus. JCV is endemic and infects a large proportion (70–90%) of healthy individuals worldwide , but infection is latent. Following primary infection, the virus establishes a latent infection which may persist in a latent state for an extended period, even in immunocompetent individuals. JCV reactivation, however, may occur, if the immune function is compromised, for example, in HIV-infected patients, patients receiving bone marrow or renal transplants and patients receiving chemotherapy . During the course of AIDS, up to 3% of patients may develop PML. For hematological patients the risk of developing PML is lower and incidence of PML in previously described chronic lymphocytic leukemia (CLL) patients is 0.53% . Irradiation of the CNS, intrathecal application of methotrexate, and severe immunosuppression are risk-increasing factors. If JCV activation occurs, the virus can cause demyelinization, beginning in the deeper brain structures and progressing rapidly . PML clinical features are fatigue, disorientation, dementia, depression, seizures, hemiparalysis, and other focal neurological signs. In most cases, the disease has a fatal course within weeks or months. Immunosuppression also develops in cases of CLL, especially following fludarabine therapy. Here, we present a PML case in a CLL patient after a long course of disease and treatment with fludarabine. JCV virus infection in this patient was proven both in brain biopsy material and blood. In March 1999, a 50-year-old man was diagnosed with CLL. He himself detected enlarged lymphatic nodes in the neck and consulted his family doctor. At that stage: WBC — 22.0 × 109/l, HGB — 143 g/l, RBC — 4.95 × 1012/l, lym — 13.2 × 109/l, PLT — 166 × 109/l, small peripheral lymphadenopathy, CLL stage II diagnosed according to Binet. For eight years he received chlorambucil and prednisolone therapy as out-patient, without achieving hematological remission. Because of disease progression received 4 cycles of COP (cyclophosphani, vincristini, prednisoloni), followed by 7 cycles FMD (fludarabine, mitoxantrone, dexamethasone). In February 2008, patient with a nine-year history of CLL was hospitalized in a surgical ward for an unrelated condition and reported a three week history of the weakness in the right leg and left hand, tremors. The patient also experienced speech difficulties, including clumsiness and a slight slur. The neurologist’s final conclusion was cortinuclear failure of the right side with central paresis of the left arm with tremor, central paresis of the right leg, and motor aphasia. An MRI diagnosed infiltrative glial tumor of the left hemisphere, proliferating predominantly in the frontal lobe, more in the gyrus frontalis superior region. The process was spreading to the frontal part of corpus callosum and putamen, and also the temporal lobe of the same hemisphere. Se­veral tiny periventricular and hyperintense subcortical vascular foci of the same nature in both hemispheres. Blood count: WBC — 4.0 × 109/l, HGB — 110 g/L, RBC — 3.50 × 1012/l, PLT — 139 × 109/l, lym — 2.22 × 109/l. Biochemical analyses without pathology, only LDH and beta2-microglobulin increased. Additional tests: Anti HIV1/2 — negative, EBV DNA — negative, CMV DNA qualitatively — negative, Aspergillus Ag quantitatively — negative, Cryptococcus Ag — negative. In March 2008, he was transferred to the neurosurgery ward. Patient was recumbent, partial aphasia, hemisyndrome of the left side. Frontal lobe cerebrotomy was performed and tissue samples taken for histological examination. CNS tumor biopsy performed. Morphology and immunoprofile of the lesion consistent with progressive multifocal leukoencephalopathy (Figure). The material was additionally examined to detect JCV DNA. DNA was extracted from 107 µm-thick sections obtained from formalin-fixed and paraffin embedded brain tissue. Sections were digested with protease K and DNA was purified on silica columns (Qiagen GmbH, Germany) according to the manufacturer’s protocol. The technique consisted of genomic amplification (nested PCR with JC1/JC2 primers in external amplification and PEP1/PEP2 in internal amplification) followed by restriction fragment length polymorphism with the enzyme BamH1. Beta-globin gene was used as a control for the integrity of the genome of the sample. After amplification with the primers, a 173 bp fragment of the JCV genome was obtained. This fragment was digested with the enzyme BamH1. The reaction mixture was electrophoresed on a 3% agarose gel. The viral subtype was determined according to the digestion bands as described previously [10.]. After digestion with the enzyme BamH1 the 173 pb band disappeared and the case was diagnosed as positive for JCV DNA. JCV was detected in the patient’s blood. The nested polymerase chain reaction (nPCR) was used for the detection of viral sequences in DNA isolated from peripheral blood leukocytes (PBL) and plasma (markers of latent/persistent and active infection, respectively). JCV and HHV-7 genomic sequences were found in patient’s PBL DNA sample. In a plasma DNA sample, only genomic sequences were detected. JCV causing PML in the patient was confirmed both in brain biopsy and blood. Motor aphasia, hemisyndrome of the left side progressed. Patient received symptomatic therapy and died a month after operation, in April 2008. Post-mortem examination was not performed. PML was first described in patients with CLL and Hodgkin lymphoma in 1958 . Association between purine nucleoside analogues and PML has been explored in a systematic study of evaluation the clinical characteristics of HIV-negative patients affected by lymphoproliferative disorders (LPD) who develop PML . In this study B-cell CLL was the most frequent underlying LPD and the most frequent treatment received was purine analogues. In the majority of previously described CLL cases PML diagnosis was confirmed with JCV detection in brain biopsy [2, 7, 8], in some cases JCV was detected in spinal fluid [9, 10]. In most of reported cases, similarly to the patient described by us, PML developed following fludarabine therapy [3, 8, 9, 10], therefore it is considered that the immunosuppressive effect of this therapy may cause JCV activation. Moreover, the case of PML development in 60-year-old male with CLL after 6 months of fludarabine therapy and without JCV infection is previously reported and authors suggested the possible role of fludarabine in producing PML-like lesions in patients with CLL . Another investigation suggests that immunosuppression caused by chronic lymphoproliferative malignancies alone may be a factor in the development of PML and chemotherapy with fludarabine may act as an additional trigger , besides some reported cases date back to the time before fludarabine was accessible for treatment [11, 12]. The present case, in addition to the previously reported, draws attention to the fact that the use of fludarabine and its combinations in CLL therapy increases the risk of JCV infection reactivation and development of serious complications like PML. Because development of PML is tightly linked to suppression and/or modulation of the immune system as in development of hematological malignancies as in monoclonal antibody treatments, further scrutiny of the course of JCV infection in immune cells will be essential to our understanding of development of PML and identification of new therapeutic targets . The present case, in addition to a few previously reported, draws attention to the fact that the use of fludarabine and its combinations in CLL therapy increases the risk of serious infection complications like PML. 1. Stolt A, Sasnauskas K, Koskela P, et al. Seroepidemiology of the human polyomaviruses. J Gen Virol 2003, 84: 1499–504. 2. Garcia-Suarez J, de Miguel D, Krsnik I, et al. Changes in the natural history of progressive multifocal leukoencephalopathy in HIV-negative lymphoproliferative disorders: impact of novel therapies. Am J Hematol 2005; 80: 271–81. 3. Gonzalez H, Bolgert F, Camporo P, et al. Progressive multifocal leukoencephalitis (PML) in three patients with standard-dose fludarabine (FAMP) Hematol Cell Ther 1999; 41: 183–6. 4. Hou J, Seth P, Major EO. JC virus can infect human immune and nervous system progenitor cells: implication for pathogenesis. Adv Exp Med Biol 2006, 577: 266–73. 5. Hammarin A-L, Bogdanovic G, Svedhem V, et al. Analysis of PCR as a tool for detection of JC virus DNA in cerebrospinal fluid for diagnosis of progressive multifocal leukoencephalopathy. J Clin Microbiol 1996; 34: 2929–32. 6. Astrom KE, Mancall EL, Richardson EP Jr. Progressive multifocal leukoencephalopathy: a hitherto unrecognizes complication of chronic lymphatic leukaemia and Hodgkin’s disease. Brain 1958; 81: 93–111. 7. Cid J, Revilla M, Cervara A, et al. Progressive multifocal leukoencephalopathy following oral fludarabine treatment of chronic lymphocytic leukemia. Ann Hematol 2000; 79: 392–5. 8. Leonard S, Hulin C, Anxionnat R, et al. Multifocal progressive leukoencephalitis in a patient given fludarabine for chronic lymphoid leukemia. Rev Neurol (Paris) 2002; 158: 1121–3. 9. Saumoy M, Castells G, Escoda L, et al. Progressive multifocal leukoencephalopathy in chronic lymphocytic leukemia after treatment with fludarabine. Leuk Lymphoma 2002; 43: 433–6. 10. Kiewe P, Seyfert S, Kцrper S, et al. Progressive multifocal leukoencephalopathy with detection of JC virus in a patient with chronic lymphocytic leukemia parallel to onset of fludarabine therapy. 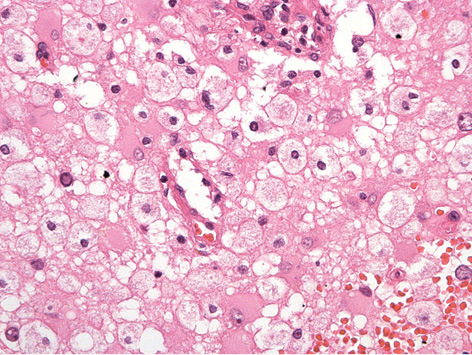 Leuk Lymphoma 2003; 44: 1815–8. 11. Kalita J, Patel NS, Misra UK. Magnetic resonance imaging may simulate progressive multifocal leucoencephalopathy in a patient with chronic lymphocytic leukemia after fludarabine therapy. Ann Indian Acad Neurol 2008; 11: 114–5. 12. Heikens J, van Berkel W, de Vos RA, et al. Progressive multifocal leukoencephalopathy in a female patient with chronic lymphatic leukemia. Ned Tijdschr Geneeskd 1992; 136: 232–5. 13. Marshall LJ, Major EO. Molecular regulation of JC virus tropism: insights into potential therapeutic targets for progressive multifocal leukoencephalopathy. J Neuroimmune Pharmacol 2010; 5: 404–17.